Leading Cheltenham Champion Hurdle fancy Darlan suffered a fatal fall while competing in Monday's trial race at Doncaster. The six-year-old, who was ridden by champion jockey Tony McCoy, fell heavily at the last hurdle and suffered a broken neck. At the time he had been putting down a strong challenge to last year's Champion Hurdle winner Rock On Ruby. Although McCoy escaped serious injury, he sat out the rest of his day's rides. Darlan, trained by Nicky Henderson and owned by millionaire JP McManus, was a leading novice last season and had been expected to prove a major rival for Hurricane Fly in next month's Champion Hurdle at Cheltenham. A faller two flights from home in last year's Betfair Hurdle at Newbury, he bounced back with a second in the Supreme Novices' Hurdle at Cheltenham before a win at Aintree. He had continued his good form this season with a win in the Christmas Hurdle at Kempton on Boxing Day. The Racing Post reported that Henderson was in tears after the horse's fatal fall and he said: "It's some game, isn't it? Why is it always the good ones?" 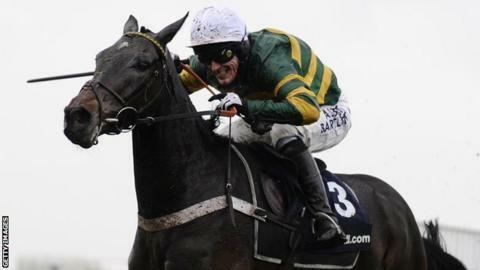 McManus and his retained rider McCoy were also left devastated in April 2012 when Cheltenham Gold Cup-winner Synchronised died in the Grand National at Aintree. Rock On Ruby's trainer Harry Fry expressed his sympathy to Darlan's connections. "In terms of the race, we didn't want a scenario like that and commiserations to all of Nicky's team and AP [McCoy] and JP [McManus]," he said. "As far as Ruby is concerned, we've come and he's done the job. He's had a good race and that will bring him on again for the day. He's jumped well enough, not as sharp as he can be, but there's improvement there. "The whole season has been built around Cheltenham and hopefully we can go there full of confidence." Trainer David Pipe added on Twitter: "Sincerest condolences to connections of Darlan - thoughts go to JP, AP McCoy and everyone at Seven Barrows [where Nicky Henderson trained Darlan]."